An infinite number of bizarre experiences await your exploration, from Dream Worlds and Alternate Earths to distant planets in our universe and others! 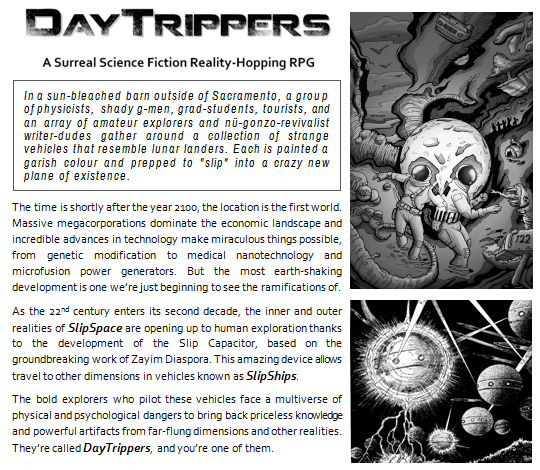 The Daytrippers Gamemasters Guide is a toolkit for creating surreal adventures that take place in weird worlds and other dimensions. With this expansion to the DayTrippers Core Rules, the GM takes the players into new and wildly divergent realities every session, blurring the line between subjective and objective reality, and cranking up the weirdness to eleven. Designed by Tod Foley (creator of Cyberspace, Ghosts in the Machine, and Watch the World Die) the DayTrippers Gamemasters Guide blends modern and traditional gamemastering techniques with the random input of oracular systems and the spontaneously-generative approach of surrealist art. Each adventure is designed to last a single session and return the PCs back to Earth, with the pacing of a short story or television episode. The result is a fast interpretive system with its own skittery mechanics, spitting out an endless variety of psychoactive science fiction narratives. Psychic Content. Oracular Prep. Narrative Resolution. Vertical Control. High Bleed. You've played like this before, but you've never seen rules for it.